Don Appleby was the 30th recipient of the Jay Ladd Distinguished Service Award. 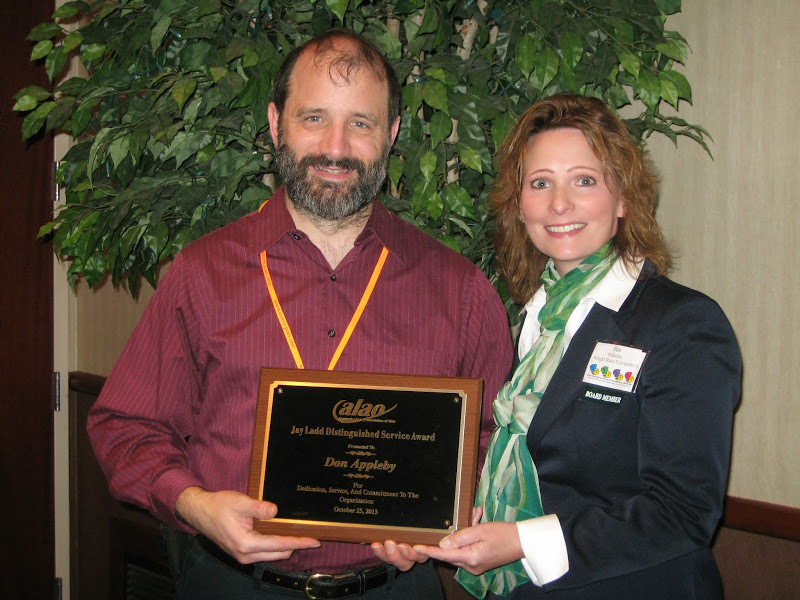 He received his recognition and a plaque at the annual conference last month. The Jay Ladd Distinguished Service Award honors the memory of Jay Ladd, a founding member of ALAO in the early 1970s. This award recognizes an individual who has been an ALAO member for at least 5 years, and who has promoted academic libraries and librarianship not only on his or her own campus, but also within the state. The award also recognizes someone who has provided leadership in the promotion of ALAO through service such as committee membership, executive board office, or interest group office. Don was recognized as a key member of both the ALAO Board and the Conference Planning Committee. On the ALAO Board, Don has served as a Board Member at Large and is currently the ALAO Treasurer. As Treasurer he keeps the CPC and Board fiscally in line. His role on the conference planning committee is to coordinate all of the audio/visual equipment for the entire conference – speakers, vendors, posters, and the keynote. This also means that he works with the venue staff to coordinate their resources with ours. He accomplishes all this with just the help of 1 or 2 student volunteers. At the University of Akron, Don is a Library Specialist at the circulation desk and the building manager for the Bierce Library. He is the advisor to the University’s chapter of Circle K and also reads to children from the University’s Center for Child Development and he never misses commencement exercises. This year we had 5 nominations, each of whom was very deserving of the award. Congratulations to each of them for being nominated and thank you to all who the time to nominate their colleagues.